The Farore & Falole Skins. Are you in need of a change? Perhaps you’ve found yourself looking dull and dreary as of late? Feeling like something is missing from the core of you? Step into a brand new skin and see the world through a new set of eyes! 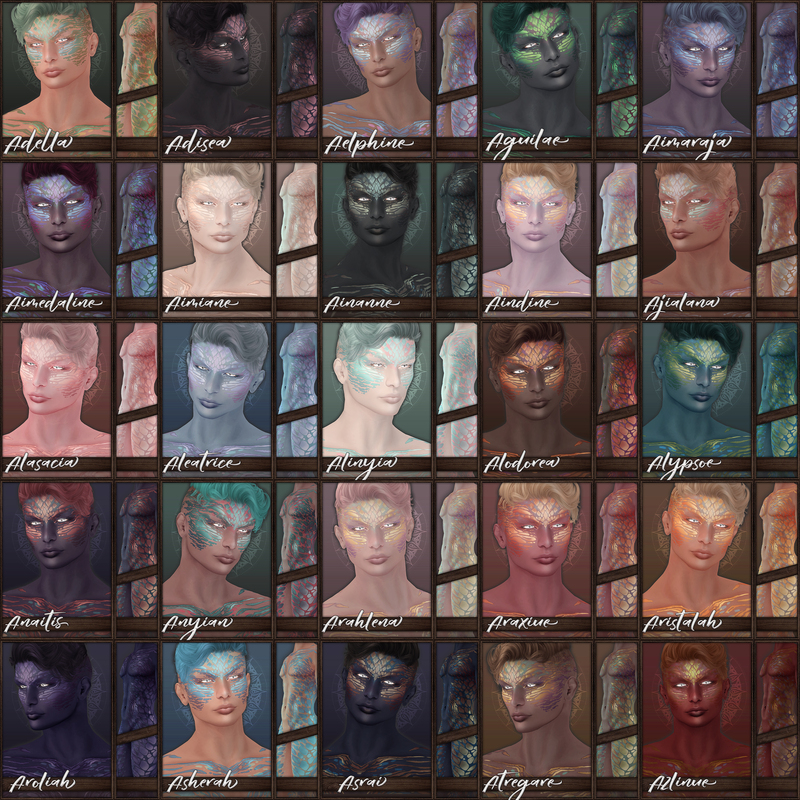 The Farore and Falole Skins are crafted with care in the highest quality to suit many needs and body types! Perfect in a fantasy or even sci-fi setting if you so choose, these skins are just waiting for you to slip inside! Get yours today and become a new you! These highly detailed skins come in both male and female versions and in many gorgeous natural tones and hues with many wear styles. 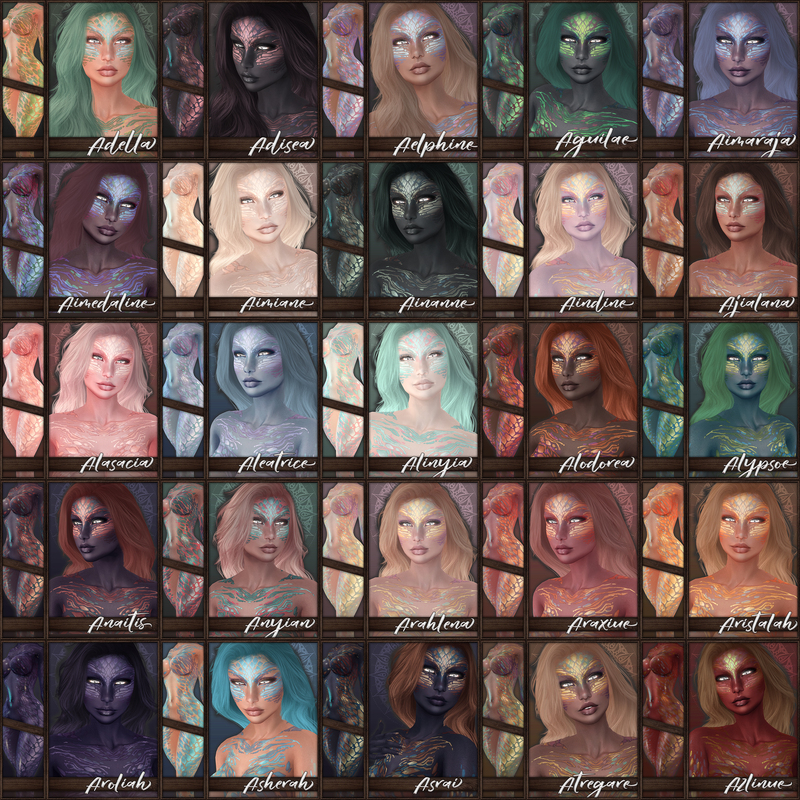 Part Mermaid, Part reptilian, these beauties are jam packed with character and appliers and everything youll ever need in a reptilian, aquatic, mermaid, or demonic skin. Omega Full Body Appliers for Brazilia, Slink, Maitreya, Lush, Sinful Needs, Perfect Bum, Lena, Ghhetto Booty, Phat/Cute Azz, Apple May, tons more. Behold! A staff of epic and Atlantean proportions! Be not afraid of it’s extraordinary power for it was crafted with you in mind! Let it entangle you in it’s tentacles and ensare your heart for it yearns for a wielder of immense talent! Dig deeply into the arcane and become the purveyor of dark arts you were meant to be! A truly fascinating relic sits waiting for you if you dare to welcome it into your collection! 100% mesh staff with custom hold animation. Hold and Back version included. HUD comes with 45 gem options and 45 base options. Modify… Gently (to heck). ~ by Vae on July 22, 2017.